Dr. Jack Kitts received his medical degree from the University of Ottawa in 1980. After interning at the University of Toronto, he completed a three year tour as a medical officer in the Canadian Forces before returning to the University of Ottawa to complete specialty training in anesthesia in 1987. He spent one year as a research fellow at the University of California in San Francisco. Dr. Kitts then joined the medical staff at the Ottawa Civic Hospital as an anesthesiologist and Research Director for the Department of Anesthesia. In 1992 he led the development of the hospital’s Preoperative Assessment Clinic which became a model for subsequent clinics, both nationally and internationally. He also became its first Medical Director. In 1995 he was appointed Chief of Anesthesia at the Ottawa Civic Hospital and Associate Professor at the University of Ottawa. 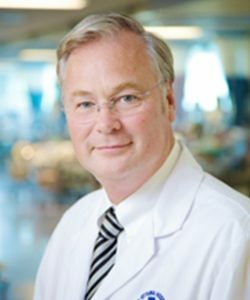 In 1998, Dr. Kitts was appointed Vice-President of Medical Affairs and led the medical staff during a complex restructuring in which three hospitals and five large programs were merged into The Ottawa Hospital. He completed his master’s degree in business administration in 2001 and was named President and CEO of The Ottawa Hospital in February 2002. Dr. Kitts continues in that position to this day, managing a staff of 12,000. The Ottawa Hospital is recognized as one of the largest and most important research and teaching hospitals in Canada. Its research institute is one of the foremost institutes in Canada, involving more than 1500 scientists, clinical investigators, trainees and staff. Dr. Kitts’ inclusive, team-oriented strategic leadership, passion to ensure delivery of quality patient-centered care, and the development and mentoring of physician leaders, has been a central, unifying force in establishing and sustaining The Ottawa Hospital’s vision to provide each patient with the world-class care, exceptional service and compassion that we would want for our loved ones. Dr. Kitts is known nationally for his focus and expertise in patient experience, performance measurement and physician engagement; which make him a sought after advisor and inspirational speaker on these key topics in the healthcare today.